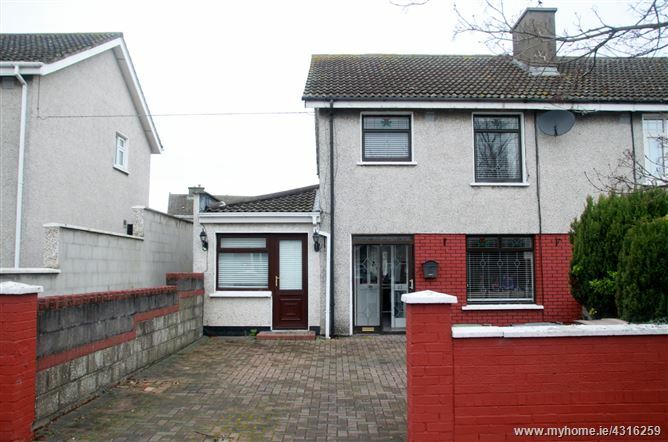 Eugene Berry MIPAV is delighted to bring to the market this 4 bed semi-detached home ideally positioned in this mature residential area, adjacent to acres of green/recreational space. Ideally located to a host of local amenities including Beaumont hospital, Northside shopping Centre and numerous schools. This property would be ideal for home and income. The granny flat is self contained and ideal to accommodate elderly parents. The main house consists of a lounge with dividing doors to kitchen/dining room. Upstairs accommodation consists of 3 bedrooms, fully tiled bathroom and attic converted to large storage/playroom area with Velux window for natural light. This is a well maintained family home with the benefit of large front and rear gardens nestled in a quiet Cul de sac.